I would like to inform you that this RFE was added in R75.40VS and you can start using it by setting the environment variable MDS_ALLOW_RENAME_GOBJECTS to 1 (and restarting the mds from the shell in which variable was set). Starting from next major release after R75.40VS, the ability will be enabled by default and there will be no need to use the environment variable. And get this. It works! The environmental variable was a kludge, they only changed the name and not the underlying references so it broke everything. In the next releases they will actually make both the names and references work together. I know, I’m a great guy, You Don’t Have To Tell Me. I found a feature/design flaw/bug/workaround in how the firewall identifies itself to the RADIUS server. 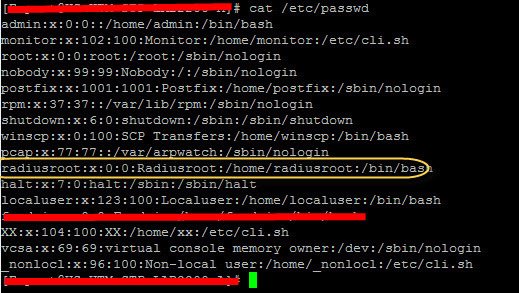 Problem: Seems that some RADIUS servers use the NAS-IP to do their database lookup for AV pairs, instead of the RAS IP. 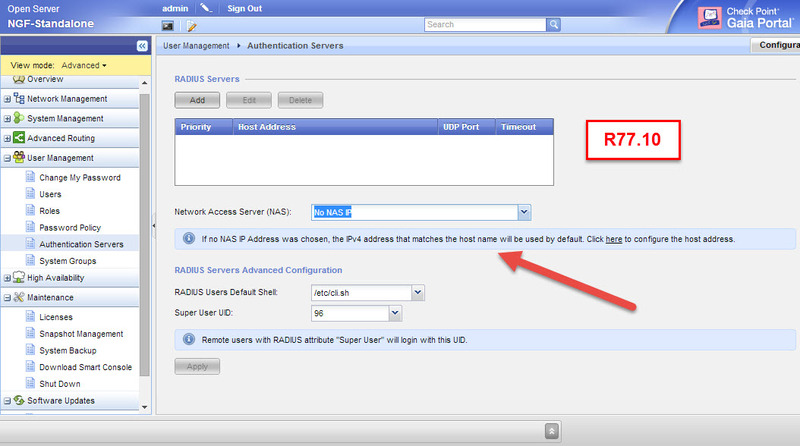 More specifically RADIUS uses the RAS IP for secret key lookup and NAS IP for AV pairs. Go figure. R77 (I am at R75.47) you can specify a default shell of /bin/bash instead of /bin/clish and then EVERYONE who is RADIUS authenticated will go into /bin/bash and not clish. So this is what SPLAT had which is nice we are finally back to where we started. I asked the developer to consider adding another Radius Attribute GAIA-user-shell, where in RADIUS you can set the shell to /bin/bash or /bin/clish for that user. He thought it was a good idea and would consider it. gaia-superuser-access attribute RADIUS attribute is used to assign a Unix UID of 0 for superuser or 96 for regular user. I haven’t seen this documented anywhere and haven’t tried it to verify. Note: The role ‘radius-group-any’ gets assigned to EVERY user by default. So if a user has a role ‘guionlyRole’, the user will get the guidonlyRole features as well as the features from ‘radius-group-any’. I haven’t see this documented anywhere. I setup my own FreeRadius server (it was easy) and customized it according to sk72940 and it looks like it works. 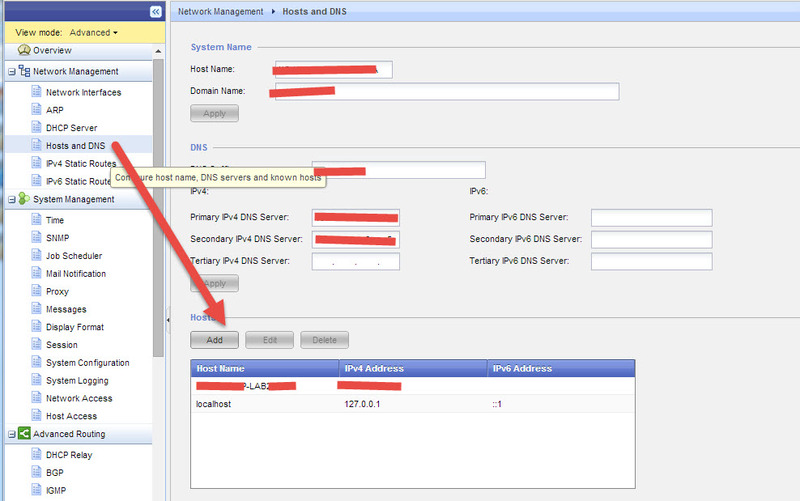 All users defined on RADIUS server. (Trying to get this to proxy to AD will be next step). 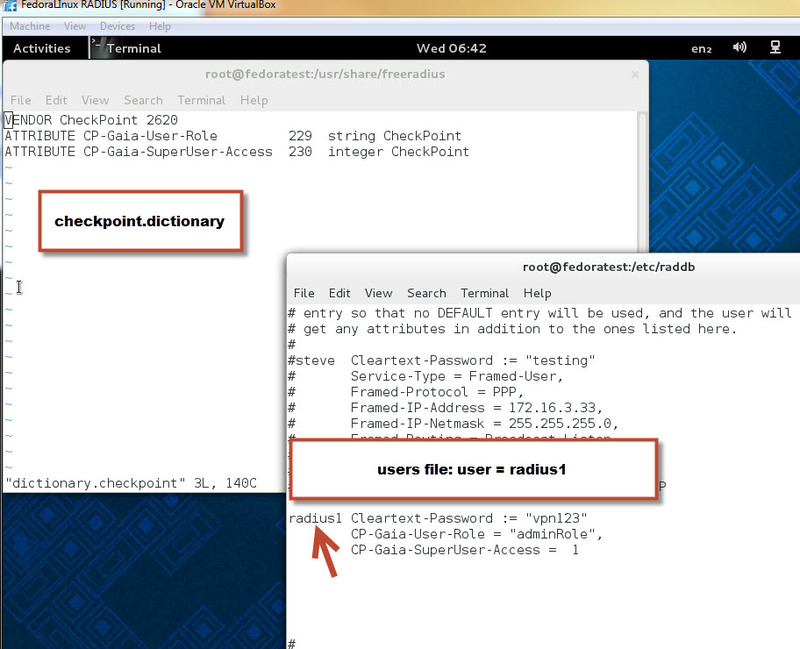 Here is the RADIUS dictionary and the user definition for user ‘radius1’. Now I log into expert mode and check out my security context. SuperUser! FYI: I can’t seem to get CP_Gaia-SuperUser-Access=0 to do anything. I can’t log in with it. cannot! execute the expert command. I just wish we could go directly into Unix mode and not have to use the expert password. Why? If someone quits we still have to change the expert password on 1000000000 of firewalls. SO how about this? 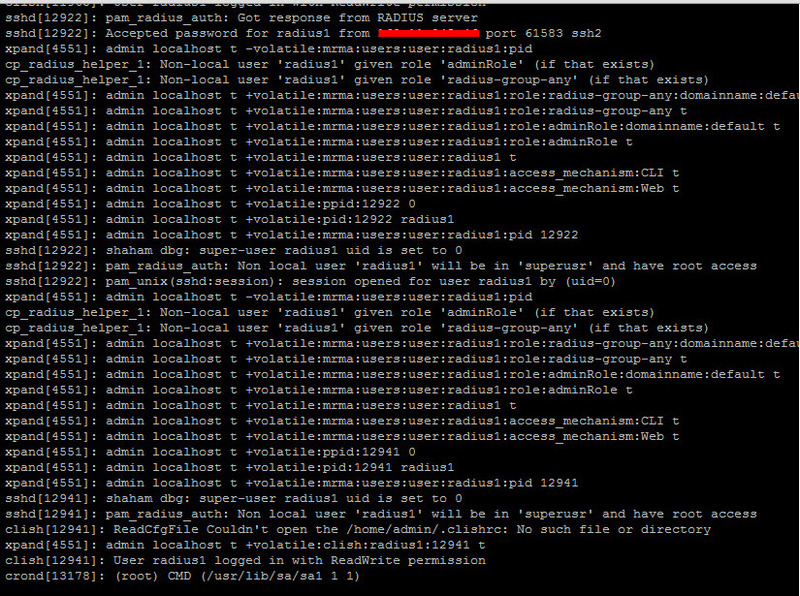 and then make ‘radiusroot’ to exist in your AD/RADIUS server, …abra cadabra…. you are notw AD authenticated into /bin/bash! Unfortunately this means you have to add bash users to all 1000000 firewalls you own. Oh well, beggers can’t be choosers I guess. I’ll let you know if I can get AD proxy going. Stay tuned! Last I heard is there is a fix to give RADIUS users either bash or clish, but not both. Haven’t tried it. There is no way they know of to RADIUS authenticate into expert mode. They claim R&D is going to fix it, but our person rolled their eyes. So the status is RADIUS users can now execute tcpdump. So you can build a ‘netdebug’ group in GAIA and give them limited access. 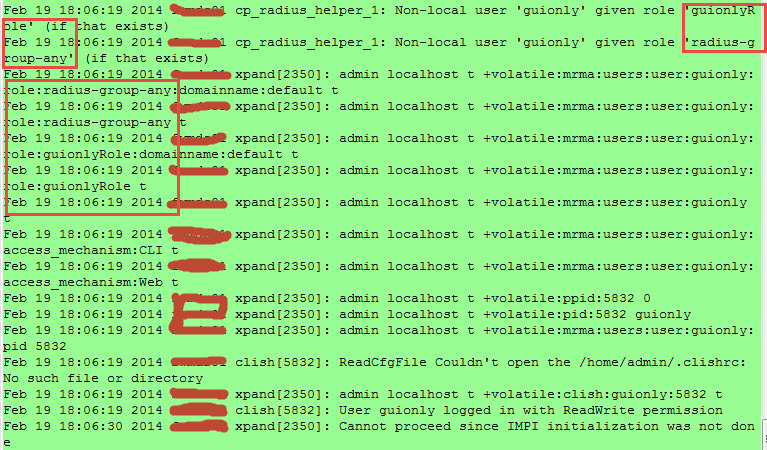 3/29/2013: Word from R&D is that Radius authenticated users cannot be assigned UID 0, so they will not be able to execute commands like tcpdump. This is a design decision. My opinion is this is a bad bad bad decision. It goes backwards from SPLAT. You can’t globally manage a disparate set of administrators. They have updated the RADIUS groups to allow RADIUS attributes so you can have more than 1 security group, but in the end you still have to hand out the expert password to get UID 0 access. How lame is that? Obviously R&D never tried changing expert passwords on 500 firewalls when an admin leaves. BUT: still have to specify virtual systems assigned to role. In large environments were many administrators have CLI access, GAIA was designed to provide a fine grain level of control over those users with ‘roles’. GAIA was like the uber-cpshell. You could have 1 group be superusers, 1 group be run-backups admins, 1 group be tcpdump type admins, 1 group be, etc. BUT, now there is only ONE RADIUS group that can only do ONE set of things. Hopefully! this will be fixed soon. I’m trying to figure out how to get around this. Unfortunately it only gets better under VSX. Well, seems OK unless you have 250 VSs on several clusters and have several different roles. Can you say exponential problem? No, you have to go through and add each VS to each role one at a time……UGH. Another RFE. NTP has changed on GAIA. SPLAT had its own convoluted cpd_sched daemon to schedule NTP polls. GAIA is using the normal Linux NTPD daemon to do its work. Thank you! NOTE that if you dink with /etc/ntp.conf, you better write protect it so GAIA does not overwrite it when it boots. and a file will be created in /etc/sysconfig/ntp that contains this config into. This file survives reboots and is used to reset the NTPd parameters. This command will enter the ‘ntpdate’ command into the cpd_sched_config list to run every 3600 seconds and poll for NTP time.